CardMonkey's Paper Jungle: ALOHA! Hawaiian Themed Blog Hop 8/20 - 8/21. 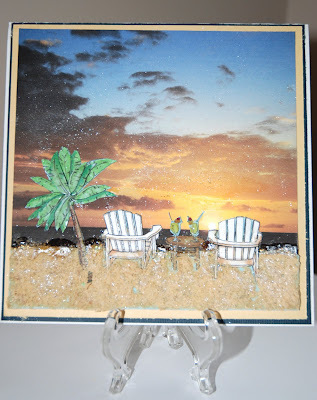 Welcome to the Hawaii-Themed Blog Hop, sponsored by the fantabulous Nicolette of Beyond Scrappin'. If you've come from Shannon's adorable Purple Lion Paper blog, you're on the right track. If you've happened upon here and want to start at the beginning, please do go to Nicolette's blog, and hang loose! For this hop, I created a card that made be feel like it was Hawaii all over again. My DH and I honeymooned there (all of the Hawaiian islands) and the South Pacific for our dream honeymoon, 12.5 years ago. Yes, it's the trip of a lifetime!!! It's the most relaxed, most tropical, most wonderful we've ever felt! 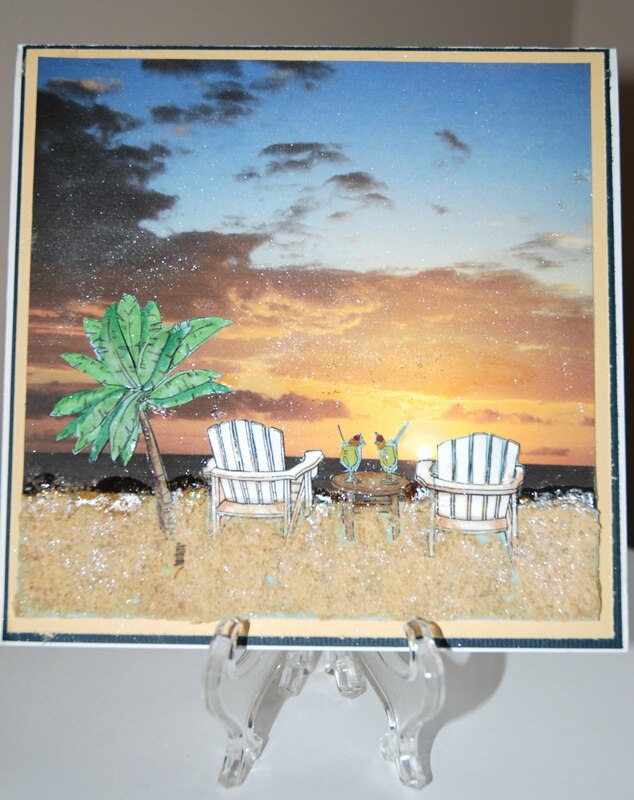 To make this card, I used as a base a print-out of one of the many beautiful sunset pictures I took on that trip. I then (separately) printed out a digi-image of beach chairs that had with it the table with drinks for two, as well as the palm tree. I colored the palm tree and also paper-pieced additional palm fronds. Next, again using Copic markers, I colored the table, drinks and shadowed the white chairs. When done, I adhered it to the base of the water at the horizon. For the sand, I was going to raid the bottles of actual sand I saved from the beaches there, but frankly, forgot I had them! So I dug around my house to see what I could use -- and came up with a blend of "shake cheese" (dried Parmesan cheese) and ground ginger! I mixed this and then adhered it to the "beach" below the chairs. Where the sand met the water's edge, I made globs of Glossy Accents combined with some mica dust, to make it look like water washing onto the shore. And you never know, I may throw in a super-surprise! 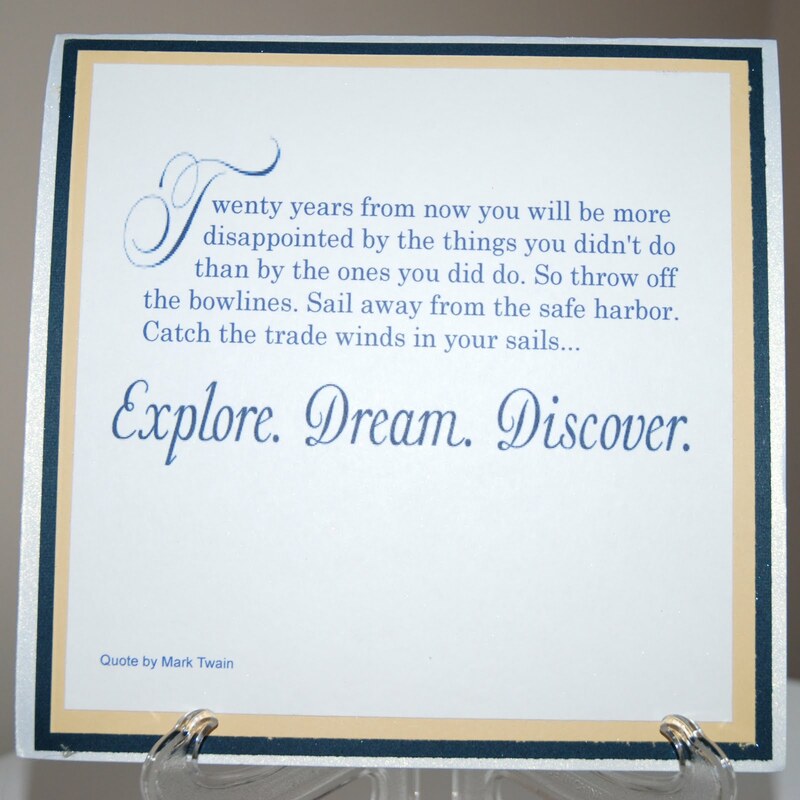 Love the beautiful card and the just "perfect" sentiment! Have been a follower for awhile. Like how you created the sand. Enjoyed vacation to Maui Hawaii couple yrs ago. beautiful card... i love it. What a stunning card! I love all the detail you put into it. Thank you for sharing. New follower. Love the card and the sentiment. Thanks for sharing. 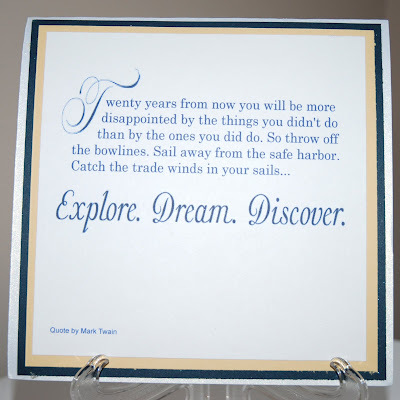 What a wonderful card and sentiment.TFS! what a beautiful card idea! Thank you for sharing! What a great card! I love the extra details that you added to it. What a beautiful card! I love all the detail you put into it. I'm a new follower. Beautiful card! I may get there some day.. This card is just stunning! I am in awe. This is just so stunning. It reminds me of a time that I took in the beauty of the ocean. Already a follower. Gorgeous card! Love the use of the photo! I love this card, Ellen! I have never been fortunate enough to visit Hawaii but I have seen enough photos to know what a tropical paradise it is. You were so creative to pair one of your trip photos with the digi image! It turned out really great! Thanks for the inspiration. I'm already a follower. I love how you used an actual picture for the background. So amazing! I love everything you did with this and how you paid such close attention to detail with the water touching the "sand". Amazing job my friend! I like the idea of using your photos as the main background for your card! Looking at card gives me serene spirit. The design is romantic yet in a sense very much creative! Thanks for sharing!